On-line training in writing functions using VBA, for use either within other VBA programs or within Excel itself. 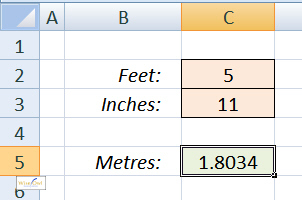 This blog is part of our Excel VBA tutorial. Wise Owl's main business is running classroom-based training courses; have a look at our Excel courses or VBA courses, for example. Suppose you want to work out how tall you are in metres, given your height in feet and inches (these are weird, archaic units of measurement still commonly used in the UK - you don't need to understand what they are to use this example). 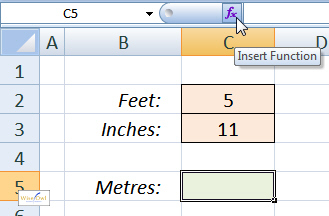 Click on the cell where the answer should go, then click on the function wizard tool. Choose to display user-defined functions (ie ones you've written). 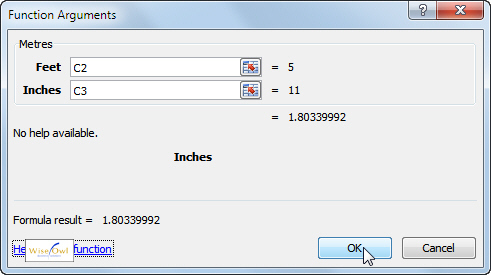 Complete the dialog box by specifying which cells will provide the feet and inches. Advanced hint: user-defined functions are "volatile". What this means is if you calculate a spreadsheet containing user-defined functions their value will always be recalculated, even if it can't possibly have changed. 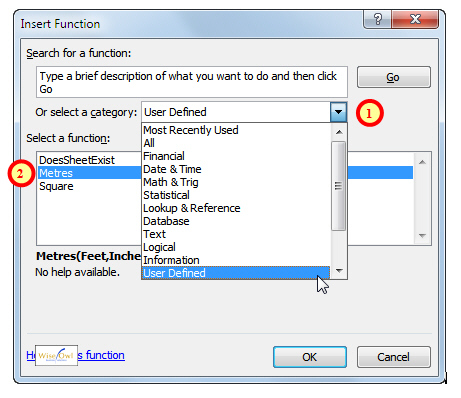 This means that if you use VBA functions extensively your spreadsheet calculation speed may drop. Personally I think Excel has got all of the functions I need, and I only ever use VBA functions within code to make programming easier.